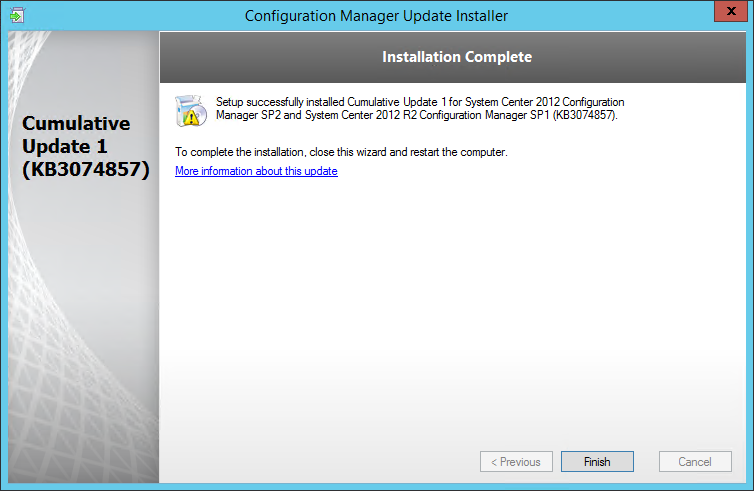 Cumulative Update 1 (CU1) for SCCM 2012 R2 SP1 and SCCM 2012 SP2 is now available. 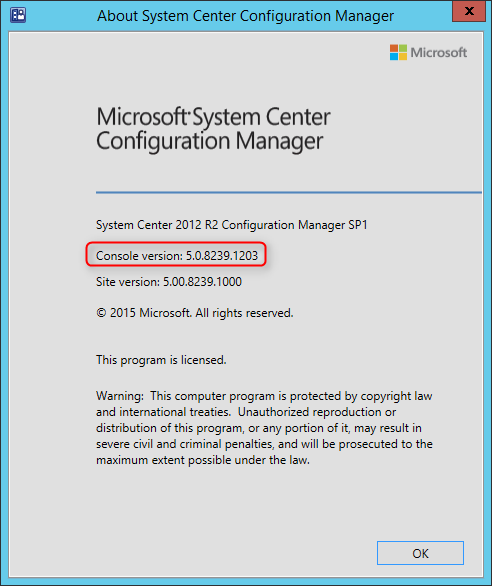 This post is a complete step-by-step SCCM 2012 R2 SP1 CU1 Installation guide. If you’re looking for a complete SCCM 2012 installation guide, see our blog series which covers it all. 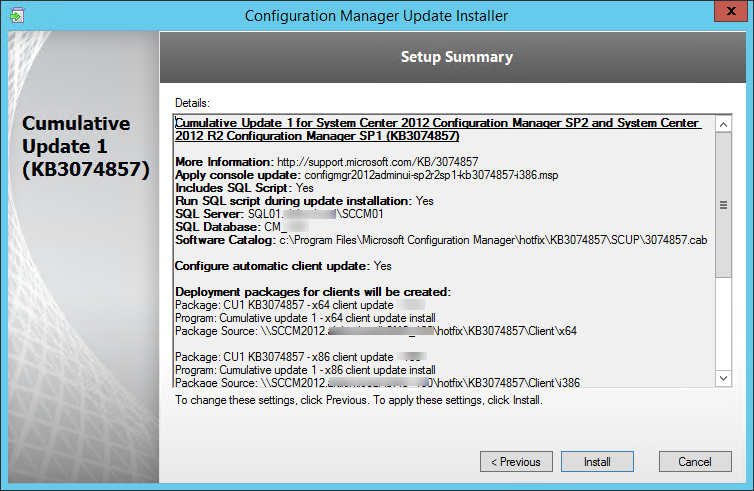 As this is the first post-R2 SP1 cumulative update, the important requirement for the installation is that SCCM 2012 R2 SP1 is installed. 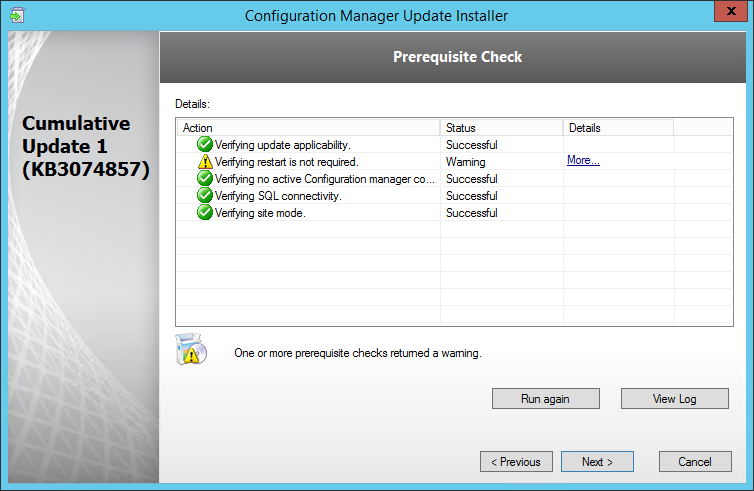 The latest non-R2 SP1 cumulative update is CU5. Don’t get confused, this CU could have been named CU6 (chronologically wise) but Microsoft has decided to reset the numbering due to the Service Pack release. 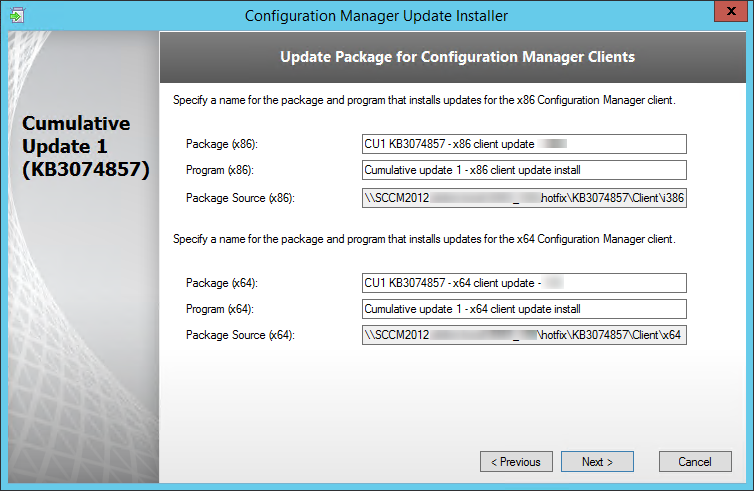 See our SCCM 2012 versions post to have a clear view of all build numbers. 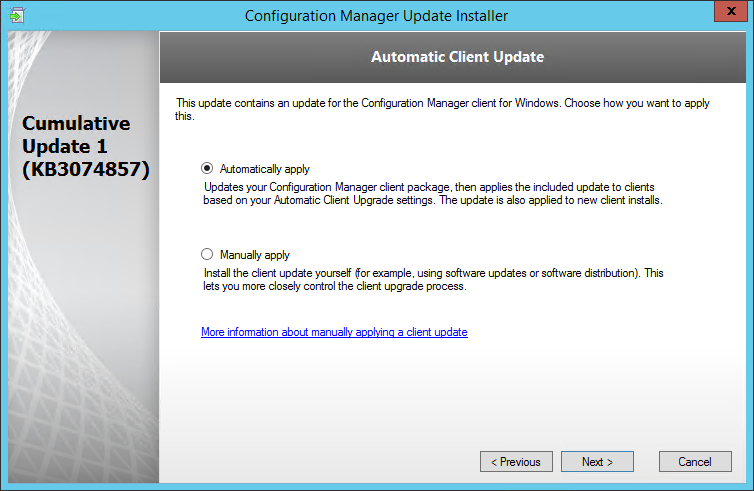 The major new functionality of CU1 is the Automatic Client Upgrade feature during CU setup wizard. This will facilitate client upgrade when applying further CU. Latest KB are included and many bugs are fixed in this cumulative update. Follow this Microsoft Support page to see a detailed list. 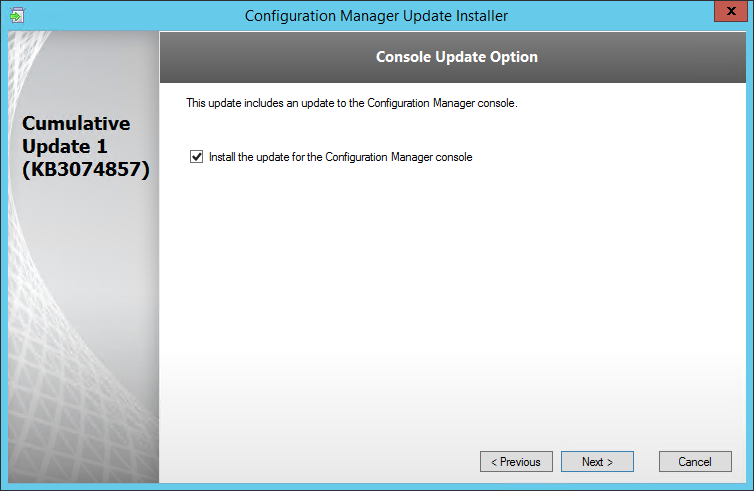 After setup is completed, launch the System Center 2012 Configuration Manager Console and verify the build number of the console. If the upgrade was successful, the console build number will be 5.0.8239.1203. Open registry editor and check the HKLM\Software\Microsoft\SMS\Setup\ key. If the installation succeeded CULevel key value will be 1. Actually, Spain is one of the few countries in the world whose national anthem doesn’t have any words! You might remember that no one was singing anything on the Spanish side yesterday. If I check the don’t upgrade servers will my 300 pull dps upgrade as they are site systems. The server admins don’t want this hitting their servers until they qa it. But I wanna make sure it upgrades the dp site servers. What exactly does the check box for don’t upgrade servers apply to? Is it all servers? Does it include site systems which are running on server os? We have just the primary and then lots of dps. I want them to upgrade the pull dps to the newer version. The check box for Don’t Upgrade servers is only for the SCCM client, not for site system servers. Installing CU on a primary server will NOT trigger an update on PullDP or other site server system. There is no real upgrade for PullDP. You should upgrade the SCCM client on those PullDP servers. I was wondering if this CU1 Update is supposed to fix the issue with Client Location Services not choosing the correct Management Point despite having the option enabled under the Site Hierarchy Properties which says “Clients Prefer To Use Management Points in Boundary Groups”…etc or something to that effect. I see in the MS Hotfix Details this update is supposed to address the above issue in “Standalone Primary” environments but nothing that says it would fix the same issue in a Hierarchy Environment. This is not the Microsoft specific explanation, but it does give background and reasoning why they did this. It’s has to do with the security structure within windows 10. Start at 10:20 location on video for idea. I’m not advocating this site, nor affiliated with it. I have A CAS 2 Primary and 7 Secondry Sites out of which 2 secondry site reporting to one and rest 5 are reporting to other. I ready STGdb question and it seems very similar to our scenario but I wanted to get clarification. We have 1 primary site and we had someone come in to build and upgraded our 2012 our infrastructure to SP1 CU1. Much like STGdb, the version remains at 5.00.8239.1000 but our clients show as 1203. Based on your earlier comments, that seems perfectly normal. We have a single primary site which consists of 2 management points, a fall back management point, a application catalog, and a bunch of distribution points. 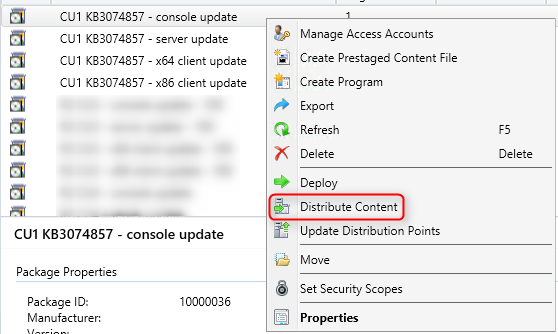 What I do not get is that you stated the CU1 KB3074857 – Server update is for site servers only (ie just the primary site server), but the vendor pushed the update out to all the site systems collection (ie every sccm server). All the updates are failing, but it seems he incorrectly pushed it in the first place. If you have to manually install it in the first place, why would you ever deploy the server update? Is it just if you have a secondary site? Also, the Microsoft article I ready says it can also be installed on an SMS Provider, but I am not sure what that is or means. Any clarification would be very helpful. Thanks. The Server Update is used for other Primary sites or site system hosting an SMS Provider. You can see if you have multiple SMS Provider in the console in Administration / Site System. Check the roles of each machine. Secondary sites are updated using the console. If you have a simple setup with one Primary Site and 1 SMS Provider, you won’t need to use this update package. Are you sure about the anti-malware client version to 4.7.0209.0 ?? My win 7 and 2012r2 machines are at 4.8.204.0 before the update. 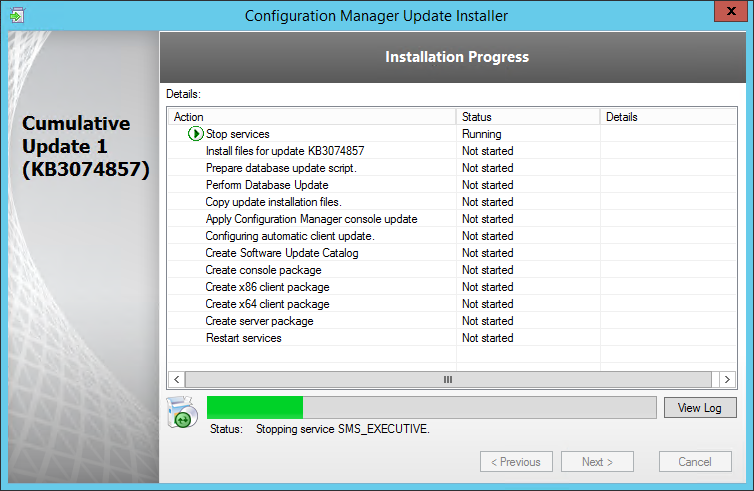 After CU1 Installation unfortunately I have Problems with SUP – the WSUS Synchronization Fails. 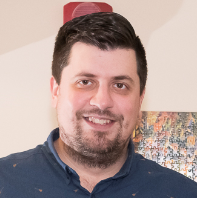 Are you using a proxy or custom ports for WSUS ? Yes, we’re using a Proxy for synchronizing software updates and downloading Content and custom ports 8530/8531 to contact WSUS. There was a problem with the Connection String to the external SQL Server inside the WSUS Config. Now everything is working fine again. We had a similar issue with the Sync failing. It turned out that the problem was related to Shavlik Patch. We went to the catalog and uncheck the 3rd party patches we had selected for Shavlik Patch and the Sync started working again. Do you know if the Shavlik issue has been resolved? Can I upgrade the client from R2CU5 directly to R2SP1CU1? Can I install CU1 immediately after SP1? Reboot necessary? Any amount of time or process I need to wait for before proceeding with the CU install? 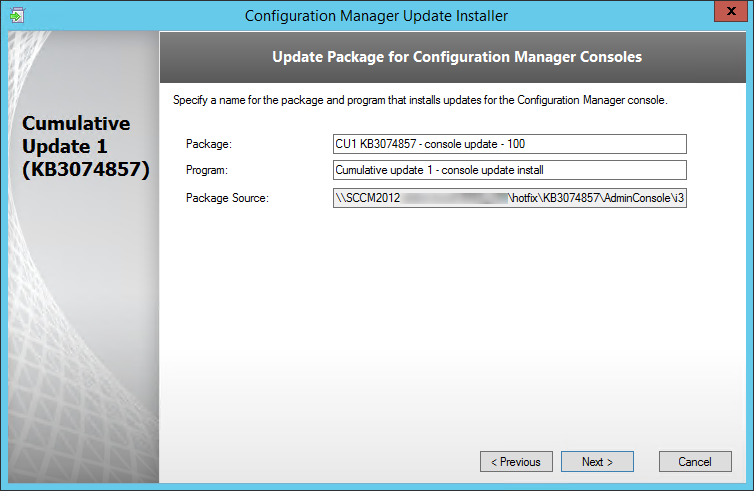 You can install CU1 as soon as the SP1 installation is complete. If you are in a hierarchy, be sure that replication is complete. Thanks for the GREAT article, it helps me to verify our own install. We are running SCCM 2012 R2 SP1 CU1. Our console and clients are updated and running 5.00.8239.1203 but the site version remains at 5.00.8239.1000 (even thought we told it to update everything during the CU1 install). We only have the one site server but I am wondering if we need to deploy the CU1 server update package (CU1 KB3074857 – server update) that the CU1 update installed onto our site? I didn’t see that step mentioned in the article so I don’t know if the SCCM 2012 R2 SP1 CU1 site version should remain at 1000 or whether it should also change to 1203? 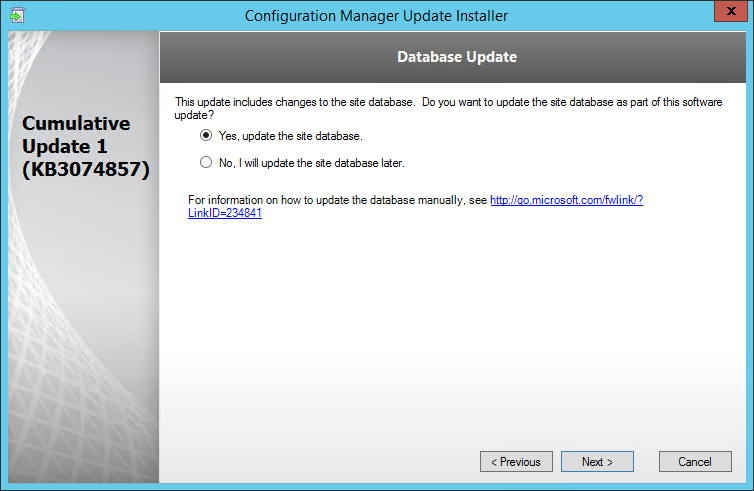 Site version only update to major version (RTM,SP1,SP2), Cumulative Update doesn’t reflet on the site version. If you applied CU1 on your site server you don’t need to apply the package. The package is created for other site servers which you don’t have. As we still have mixed environment of 2007 & 2012. 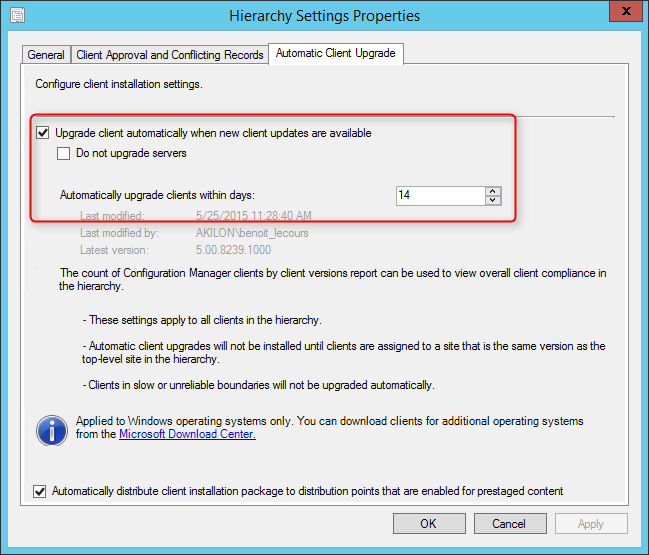 Will this new “Automatic Client Upgrade” ONLY upgrade those 2012 clients or 2007 clients? I guess it should work but haven’t test that scenario. 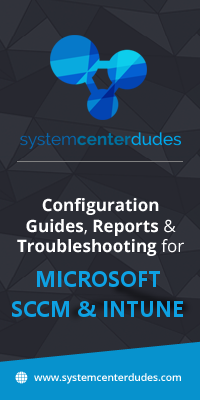 thanks a lot for sharing your experiences, perfect guides for updating the SCCM environment. 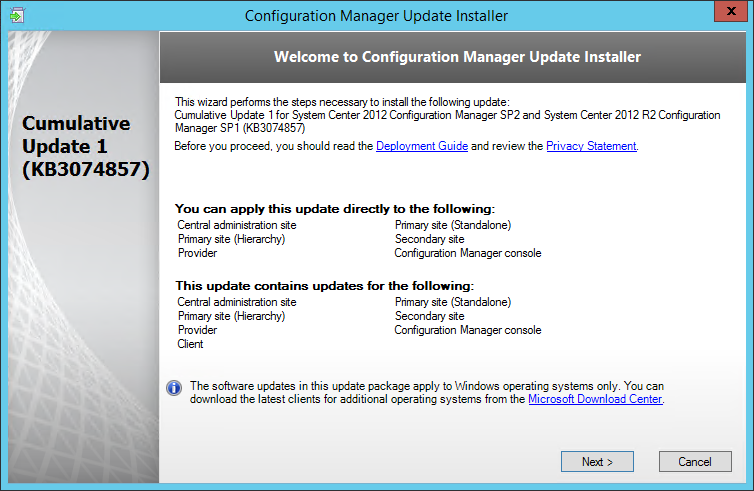 At the moment we are planing to update our environment from version SCCM 2012 R2 CU to SP1 CU1. Now i have a question. If i’m right we have to do the update in two steps because of the server replication delay time (first SP1 and a few days later CU1). It would be interesting to know if we have to update the clients only once or do we have to rollout the SP1 client update first? Is it possible to do the step from R2 CU4 to R2 SP1 CU1 directly? You can update your client directly to SP1 CU1. Thanks for your pretty helpful post. This update seemed to break HTTPS communication for me. I have my SCCM environment working on PKI infrastructure and after installing this update, WSUS and IIS seem to be broken and complaining about Ports not communicating over HTTP. I have the same problem after update. I try run iisreset and register asp.net but I have no luck. Did either of you manage to fix your issues with HTTPS? Just try to reinstall SCCM Client on site server (i do it over push). I don’t now how, but it’s resolve my issue with HTTPS 500 MP error. Sorry for my english : it’s very poor. Well, i have an infrastructure TEST. It’s an environnelent cloud installed by my collegues. I have one server primary sccl 2012 R2 with 2 servers only with a role DP. yesterday i have upgraded to SP1 without problem. But now, i have 1 problem : new package named “config manager client” (size 180 mo) doesn’t copy on DP. WHY ? What do i do on servers DP ? Regardez les logs de distribution afin de savoir ce qui ne fonctionne pas. Les DP n’ont pas besoin d’être mis à jour à SP1 mais leur client respectif oui. Great post, thanks. Also, is it correct that the Site version and the Admin Console version numbers should not match? Great post! I was also wondering why Site Version isn’t updated from SP1… it says it does.. probably do but not visible? Hi Benoit, and thanks for this great step by step documentation. Is it normal that site version stay in 5.00.8239.1000 (I think so, it’s the same on your picture) ? And what about the MP server client version (which is 5.00.8239.1000 too) ? Is it possible to create a device collection to check the installed Console (r2 sp1) CU1 ? Thanks for the write up. It looks very good. Since there are no updates that impact the imaging process do you still recommend updating provisioning Task Sequences to include the new client? 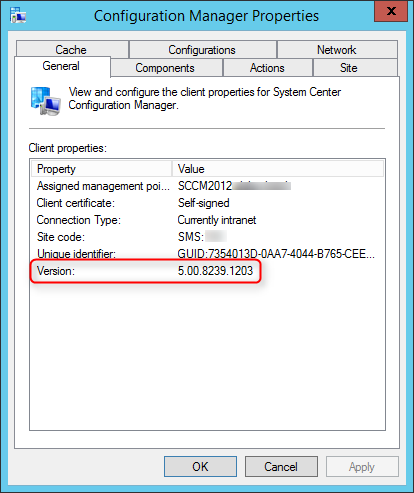 I haven’t dug into the client package yet, but I assume that this is a MSP patch that goes to the SCCM 2012 R2 SP1 client? If so, that means we would need to use the same existing methods to install a PATCH during installation of the SCCM client during OSD. James, I was wondering how you added the update to your OSD task sequences as well? I didn’t see a reply and was hoping someone could chime in with their suggestion as I’m struggling to come up with the best solution. What other servers than the primary site server should we deploy the server update to? Do site systems need the update? Site systems (DP,RP,SUP…) if located on separate server doesn’t need to be updated. Thanks for sharing his knowledge. but if I use commandline “msiexec.exe /p \\sccm\SMS_ASD\hotfix\KB3074857\AdminConsole\i386\configmgr2012adminui-sp2r2sp1-kb3074857-i386.msp /L*v c:\configmgr2012adminui-sp2r2sp1-kb3074857-i386.msp.LOG REINSTALLMODE=mous REINSTALL=ALL” everything is OK. The same thing with a new console update from KB3081699. Same error. This could be a permission error. When you launch the installation using SCCM, it runs with the SYSTEM account. Is it possible to select the option to manually/automatically apply the CU across the environment outside of the install? I upgraded to CU1 and during the installation I didn’t get the option for automatic /manual upgrade, not sure why. Our lab is stand alone primary site server. Can someone assist on why. After upgrade is complete, in Hierarchy settings the option to Enable the automatic client push is greyed out. All registry key seems to be updated correct as expected. First time I heard something like this. Have you look the CU1 installation log located in C:\Windows\Temp ? I am not able to open the log ConfigMgrUpdateSetup.log. It crashes whenever I open, even in notepad it displays as ASCII. Hi Benoit 🙂 Hope you are doing well. Have you noticed that Microsoft removed endpoint protection on WIN10 and use Windows defender ONLY. There is no KB and blog mentioned this change.